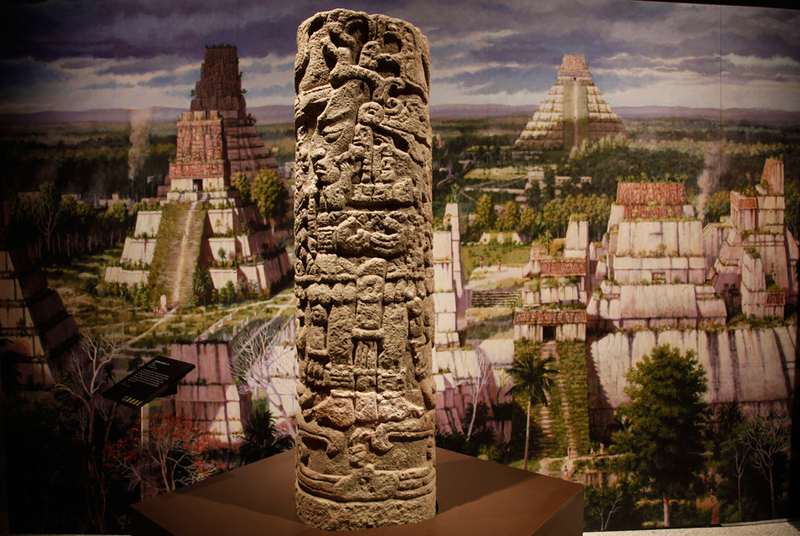 The stone Copan Stela 11 is shown at the Maya 2012: Lords of Time exhibit at the University of Pennsylvania Museum of Archaeology and Anthropology in Philadelphia. The exhibit opened May 5. AP Photo/Matt Rourke. PHILADELPHIA (AP).- If the world ends on Dec. 21, 2012  as some believe the Maya predicted  that leaves plenty of opportunity to see a new exhibit that examines the civilization's ancient kingdoms, intricate calendar systems and current culture. Experts at the Penn Museum in Philadelphia apparently give little credence to the apocalypse myth, considering the show runs through early 2013. But they say the legend, which has been perpetuated in pop culture through disaster movies and sensational tabloid headlines, offers a chance to engage people about ancient and modern Maya society. "Maya 2012: Lords of Time" features artifacts excavated from the historic Maya ruins of Copan in Honduras, including burial jewelry, food vessels and ceramic figures. Honduras President Porfirio Lobo Sosa is scheduled to cut the ribbon when the exhibit opens on Saturday. The show also uses interactive displays to explain the culture's glyph writing and sophisticated timetables. The upshot is that while it's human nature to seek ancient insight into the current world, people should not interpret the Maya calendar as predicting a cataclysmic event. "It's just a turn of a cycle," said curator Loa Traxler. Regarded as one of the world's greatest early societies, the Maya lived for centuries in parts of Mexico and Central America. Many of their iconic pyramids and other city remnants still stand in places like Copan, where 16 Maya kings ruled for about 400 years. As early astronomers, the Maya devised various types of calendars by observing celestial movements. Their "Long Count" calendar begins in 3114 B.C. and marks time in roughly 394-year periods known as baktuns. Thirteen was a sacred number for the Maya, and some scholars believe the 13th baktun ends on Dec. 21, 2012. Penn Museum experts say it ends Dec. 23, but that then another calendar cycle will begin  not Armageddon. Honduran officials don't seem concerned. Norma Cerrato, minister counselor of legal affairs for the country's U.S. embassy, said during a recent exhibit preview that she hopes it encourages people to visit the actual ruins. The show includes replicas of large stone carvings too delicate or unwieldy to leave Copan, designated a world heritage site by the United Nations' cultural agency. "Regardless of what some may say about the December 2012 phenomenon, the people of Honduras are certain that this year provides us a unique opportunity to share a part of our history and culture with the world," Cerrato said. Mexico, too, has designed a tourism campaign around the 2012 date. It's expected to bring an extra 12 million visitors to the country, possibly boosting tourism revenue by $14.6 billion, according to officials there. Though the last independent Maya city was conquered by the Spanish in 1697, Traxler said about 7 million people currently identify as Maya. The exhibit ends with translated video interviews with a half-dozen Maya, some of whom are bemused by the hype. Jose Huchim Herrera, a Yucatec Maya and archaeologist, said in a video that anyone talking about a 2012 catastrophe is clearly an outsider. "The Maya say nothing," he said. "The Maya are very peaceful. They are not worried."